A small combination web server/screenshot tool. Creates a snapshot of your Windows PC on demand, and then serves it over http. web server that will capture a snapshot of the screen whenever a specific page is visited by a web browser or other http client. 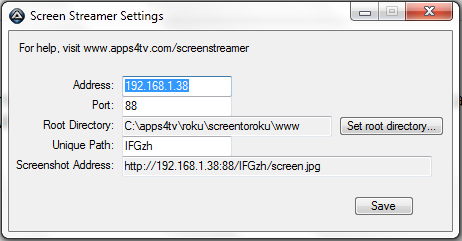 To use , download the current version and open the ScreenStreamer application. Address: The server will only bind to a single IP address. If your system has multiple addresses (e.g. if you use VPN software or have multiple network cards in use), you may need to identify the correct one. Refer to the Network Devices control panel to determine your addresses. Port: The server will use port 88 by default. If you have another web server, you may wish to choose another port. Root Directory: This is where the server will store snapshots, and also where you may place other files you want to serve. Unique Path: Since this program will create a screenshot anytime someone hits the correct link in their browser, let's not make it easy to guess. The server will create a random five character path the first time it starts. You can change it to something easier to remember (or even harder to guess), at your own risk, if you so desire. Screenshot Address: The constructed URL to use in order to see the hosted screenshot. Click it to view in your browser.